Art Gallery of New South Wales, Sydney, Australia. Framed oil on canvas painting of entrance to Port Jackson titled Sydney Heads by Eugene von Guérard made in 1865. The artwork and frame are both in good original condition. Dimensions: 560 x 940mm stretcher; 755 x 1133 x 58mm frame. Eugene von Guérard, painter and teacher, was born in November 1811 in Vienna. From 1826, he toured Italy with his artist father and between 1830 and 1832 resided in Rome. From around 1839 to 1844, he studied landscape painting at the Dusseldorf Academy, and travelled widely. In 1852, he moved to London, and in August that year decided to travel to Victoria, Australia to try his luck on the goldfields. 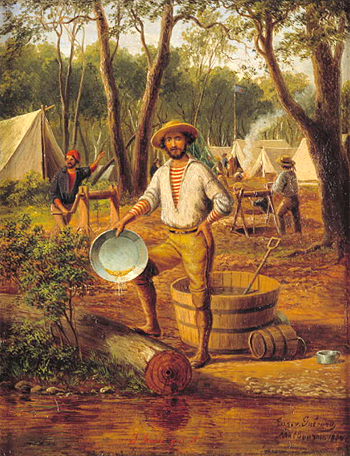 He arrived at Geelong on 24 December 1852, and made many sketches of the mining districts around Ballarat until 1854. He moved to Melbourne, and in 1870 was appointed the first Master of the School of Painting, National Gallery of Victoria. He retired from this position at the end of 1881, and in 1882 departed for Europe. In 1891, he moved to London, and died in London on 17 April 1901. He is buried in Brompton Cemetery, Chelsea, England. Sydney Heads is the only known Sydney work by von Guérard and was started during a trip to New South Wales in November 1859, when he visited Sydney, the Blue Mountains and the Illawarra region. The painting was later finished in his studio in Melbourne six years later, probably based on a drawing he did during his stay in Sydney which is in the State Library of New South Wales, Sydney. Von Guérard’s atmospheric rendering of this light-filled scene, together with his sensitive and precise depiction of topographical detail and human activity within a tightly controlled composition, makes Sydney Heads one of his finest paintings. Sydney Heads combines luminous optimism and beauty with the wild un-tamed wilderness. The work communicates a partly civilised landscape slowly overtaking the wild low heathlands of Sydney. The work relates to both homestead portraits and wilderness views in his other work. Sydney Heads sits within a wider international context of European artistic interpretation of newly colonised lands set among the wilderness landscapes. Sydney Heads has parallels with the work of the ‘Hudson River School’ artists in America. In the nineteenth century an interpretation of Sydney harbour was an essential subject for most artists. It was often cited at the time as the most beautiful harbour in the world. The heads to Port Jackson was the first sight of the new land for many migrants and the first step towards gaining international wealth and fame for people departing. 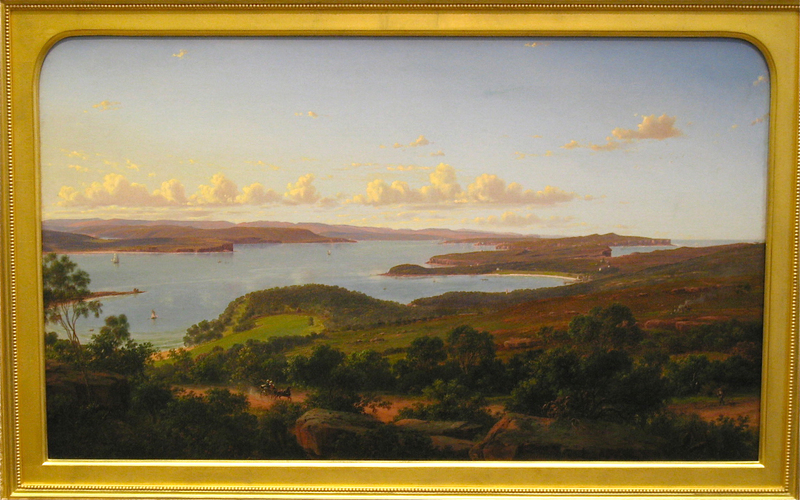 Like may artists before and since, von Guérard attempts to realise the timeless qualities of Sydney Harbour in a work that captures the broad sweep of landscape from Vaucluse Bay on the left to Watson’s Bay and Sydney Heads at the right, with the road to South Head in the foreground. The accuracy of his view may be confirmed today from the vicinity of ‘Johnston’s Lookout’ in Vaucluse, the probable viewpoint for the artist’s initial drawing. While attempting to capture the view accurately and depicting a view already quite famous for its grandeur and beauty, von Guérard also appears to endeavour to instil an emotion that goes beyond a mere topographical painting- or a ‘view’. Von Guérard scholar Candice Bruce suggests that during the artist’s training at the Kunstakademie in Dusseldorf (c.1839 – c.1846) he probably saw the work of the principal German Romantic painter Caspar David Friedrich, whose style and mood his work later evoked, and became familiar with the main exponents of German Romanticism, Carl Gustav Carus and ‘Novalis’. The influence of von Guérard’s earlier teacher in Rome, Giovannibattista Bassi – who taught in the traditions of Salvator Rosa, Poussin and Claude – also encouraged an interest in concepts of ‘the sublime’ and ‘the picturesque’ in art. In the newly established landscape class at the Academy, von Guérard was encouraged to go on long sketching trips in pursuit of the new naturalism or ‘Naturegetreue wiedergabe’ (a response true to nature). (in Joan Kerr) While in Rome von Guérard became involved with the Nazarenes, a group of German expatriate artists. For the German Romantic landscape painter, each painting was an ‘Erdlebensbildnis’ or painting of the life of the earth, in which a focus on the microcosmic details of nature led to an awareness of the macrocosmic presence of the soul of the world. No detail was inessential. Hence von Guérard’s attention to detail, visible particularly in the painting of the foreground trees and shrubs, which was typical of his practice, and demonstrated the specific influence of the German ‘Nazarene’ painters with whom he had also enjoyed some contact in Rome. A key belief of the German Romantic painters was that painting should be an expression of personal insight into the divine qualities perceived in nature. In Sydney Heads, von Guérard celebrated with semi-religious reverence, the sublime beauty of the scene. Selecting an elevated viewpoint affording a panorama of the harbour and its surrounds, the artist aimed to inspire a sense of awe and wonder in the viewer by accentuating the vastness of the sky and by implication, suggesting the great expanses of the world beyond. The scientific accuracy of his work has recently led to a reassessment of Guérard’s approach to wilderness painting, and historians believe it likely that the landscapist was strongly influenced by the environmental theories of the leading scientist Alexander von Humboldt. Sydney Heads reveals the optimism felt in the growing colony with it new found wealth of gold and streams of investment funds. Migrant miners and labourers were flooding into the colonies boosting the population and adding multicultural influences that diluted the previous ‘currency’ (local born) generations of convict and military offspring. With the rush of people from other parts of the world came new ideas, culture, art, and science, religious and political philosophy that injected a cosmopolitan liberal air into Sydney and Melbourne society. This was despite the fact that beyond the township limits the wilderness and bush was as still as harsh and unforgiving as it had been since 1788. Despite this, the romanticised view continued to grow creating unrealistic ways of seeing the bush in terms of a romantic yeoman’s paradise. This comes though in the art works and material culture of German, French, Italian, Jewish and American migrants and their influence on local artists. As Master of the School of Painting at the NGA, von Guérard influenced the training of local artists for 11 years. His reputation, high at the beginning of 1870, had faded somewhat towards the end because of his rigid adherence to picturesque subject matter and detailed treatment in the face of the rise of the more intimate Heidelberg School style. Amongst his pupils were Frederick McCubbin and Tom Roberts. The artwork is historically significant for Von Guérard’s German Kunstakademie interpretation of the environment. A view shaped by influence of the evangelical church and liberal capitalism that was sweeping the world on the tail of the industrial revolution. The artwork has aesthetic significance in the luminous optimism, beauty and wild untamed wilderness conveyed in the artistic devices such as light, scale and space. This work was done at time when the way colonial society saw itself was changing. The artwork is significant for researchers as an excellent example of colonial interpretation of the Australian environment. The artwork has significant social value, being an iconic object and a symbol of Australia’s development of the early settlement at Port Jackson into a flourishing liberal sophisticated society. The artwork is well provenanced and documented. It was donated to the Art Gallery of New South Wales by Major H.W. Hall 1974 and has been in the collection ever since. The artwork is extremely rare and valuable artwork. It is also rare object from the colonial Australian art world. The artwork represents a time early in Australia’s history when the colony was still establishing itself and exploring its new environment. The artwork also represents the coming of Europeans to Aboriginal Australia and the European ‘way of seeing’ an ancient landscape. The artwork is in excellent condition for its age and material. The artwork interprets the shifting consciousness of colonial society from stoic hardship under the ‘government system’ to a growing sense of optimism and piety surrounding the rise of liberal capitalism that leads to a religious superiority over the environment and divine right to prosperity derived from the exploitation of the landscape. It also interprets the change from the brutal convict origins of European Australia to a migrant based market based economy. Australian Collection Focus Series, Art Gallery of New South Wales.